It features a scream machine, a dreskeleton, a variety of sensors, a multiscreen system and interactive images and sound. This new project was developed in Ladines, Celrà, Turin and Barcelona. Hipermembrana is a mechatronic performance with three performers, a scream machine, a dreskeleton and many different sensors. The performance takes place in a scenic space equipped with lighting and audio systems; there is a large screen at the back and on either side at the front a small screen and the scream machine. The scream machine is a musical instrument consisting of a projector that shows the faces of three characters on a 1:1 scale who produce onomatopoeias. The dreskeleton is an exoskeletal body interface worn by Marcel·lí. Using sensors and the dreskeleton, the performers can control the sound, the images that appear on the screens and the scream machine, and in this way the narrative structure is woven. Hipermembrana sets out to explore the nature of myths, and to this end it combines different elements such as the landscape of Dante’s hell, the myth of the Minotaur and the shape of the eucariotic cell. These elements are interconnected using a narrative technique that consists of layering graphic and literary story-lines thus enabling unexpected twists and turns and a wealth of creative expression. 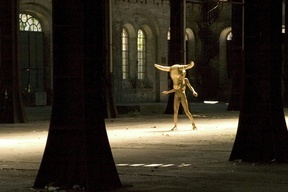 The choice of the Minotaur as the central figure of the performance allows for interesting metaphors, such as for example the conflict between rationality and animal nature in humans. Hipermembrana is the second part of the Membrana project. 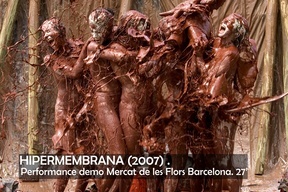 Membrana is a process of creative research – among others it comprises, Protomembrana, a mechatronic conference, and Metamembrana, a dynamic installation. Technical assistants: Carles Comes, Olivier Bertholin, Sebastiano D’Aprile, Flavio Nilo Quercia, Domenico Graziano, Lucio Gagliardi, Luca Restagno, Luca Schiatti, Alessandro D’Arias, Alberto Buzio, Xian Zhang, Davide D’Andrea, Chiara Cordero, Federica Pecoraro, Elena Pellizza, Alessandro Carlaccini, Valentina Tibaldi, Silvia Giachelo. In co-production with: Mercat de les Flors, Temporada Alta 2007 – Festival de Tardor de Catalunya. In collaboration with: Art Futura (Barcelona), Centro de Investigación Artístico Ladines (Ladines, Astúrias), CIDAN Laviana (Laviana, Astúrias), L’Animal a l’Esquena (Celrà, Gerona), Servi di Scena opus rt (Torino, Italia), MULTIDAMS (Facoltà di Scienze della Formazione –Università di Torino), CIRMA (Centro Interdipartimentale per la Ricerca sul Multimediale e l’Audiovisivo – Università di Torino), Politecnico di Torino – Corso di Laurea in Ingegneria del Cinema e dei Mezzi di Comunicazione, Virtual Reality & Multimedia Parl, Laboratorio MM Guido Quazza, Institut del Teatre-Diputació de Barcelona. With support from: Generalitat de Catalunya, Departament de Cultura i Mitjans de Comunicació, ICIC (Institut Català de les Indústries Culturals), ICUB (Institut de Cultura de Barcelona), INAEM, Ministerio de Cultura, Regione Piemonte, Città di Torino. Thanks to: Montxo Algora, Cuco Suárez, Vanessa Vozzo, Antonio Pizzo, Tatiana Mazali, Toni Cots, Maria Muñoz, Pep Ramis, Ramon Vila, Fortià Cases, Anna Antúnez, Gori Cases, Teatro Stabile Torino, Sistema Teatro Torino, Alex Reig, Pere Salabert, David Apfel, Alex Posada, Hangar.